Oakley spent a decade playing for the Knicks, and Green felt that Dolan was wrong to hit out at Oakley after his contributions benefited the organization. Oakley was ejected from Madison Square Garden during a game Feb. 8 after a physical altercation with security guards. He was arrested and later banned from the arena. The ban didn’t last long after commissioner Adam Silver intervened, with the help of Michael Jordan. “You doing it for me, it's all good. You doing it against me — you speaking out against my organization — it's not good anymore? That's a slave mentality. A slave master mentality. 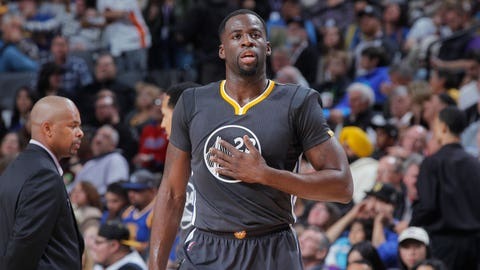 That's ridiculous,” Green said on his “Dray Day” podcast. Oakley has told reporters that he remains angry over the situation, particularly Dolan’s suggestion that he has a drinking problem. It is unclear if and when he will return to the Garden for a game.